(B : Mostly looks clean but you may notice visible scratches or minor wear on certain area(spot) fyi:(Most of computer components like CPU, RAM or motherboard belong to this grade). for more details). Batteries are likely dead. Hello from Adcomp LLC! We are also unable to cancel orders once the unpaid item process begins. Mac Pro: Mac Pro (Early 2009), Mac Pro (Mid 2010), Mac Pro Server (Mid 2010), Mac Pro (Mid 2012), Mac Pro Server (Mid 2012). Mac Pro (Mid 2012) MD770LL/A - 3.2 GHz Quad-Core, MacPro5,1 (A1289) EMC# 2629. Mac Pro (Mid 2012) (BTO/CTO) - 3.33 GHz Six-Core, MacPro5,1 (A1289) EMC# 2629. Mac Pro (Mid 2012) MD771LL/A - 2.4 GHz Twelve-Core, MacPro5,1 (A1289) EMC# 2629. We'll strive to be perfect and keep 100% positive. Apple Mac Pro PCIe RAID Card A1247 Battery UNKNOWN. Condition is Used. Shipped with USPS Priority Mail. Used Apple Mac Pro Raid Card A1247 in working order. Battery likely needs to be replaced as it doesn’t seem to hold charge but works anyway. Technical Information NurTech Technology, LLC, was established in 2006. About NurTech Technology! Our Warranty Policy. Raid levels supported are 0, 1, 5. 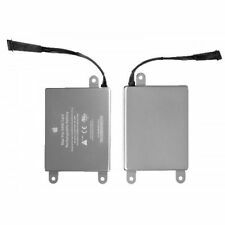 NEW Apple 923-00865 922-8964 RAID Battery 2009, 2010, 2012 A1289 020-6315-A. Mac Pro (Early 2009) - MacPro4,1 - MB871LL/A (2.66 GHz). Mac Pro (Early 2009) - MacPro4,1 - MB535LL/A (two 2.26 GHz). Mac Pro (Mid 2010) - MacPro5,1 - MC250LL/A & MC560LL/A (Quad-Core). R2/Ready for Resale, Tested for Key Functions. New, unused item. Local Pickup. We are happy to help you! The COA (Certificate of Authenticity) sticker is located on the unit and has the Product Key needed to be able to load that OS on your unit. This warranty period begins on the date the item is received. The label on the inside say: part no: 620-2244, ss62806vnh7a. xserve raid 7000g / 14 x 500g / 2x2gb fc/batt-usa, apple a1009-7 6/3.8a. Storage is in fair condition, has been tested working and is guaranteed fully functional. Includes: 7 x Hitachi Deskstar HDS725050KLAT80 500GB Drives 4 x Hitachi Deskstar HDS724040KLAT80 500GB Drives 2 x CA1009 PN 603-6332 Module 2 x APPLE 620-2106 Fan 2 x 620-2743 Xserve Raid Battery Module 2 x Power Supply Item has wear from previous use including scuffs, scratches and blemishes. Photos of actual item for sale. Storage is in fair condition, has been tested working and is guaranteed fully functional. Includes: 2x 603-6332 CA1009 controllers 14x 620-3084 400gb Hitachi deskstar hard drives Item has wear from previous use including scuffs, scratches and blemishes. Photos of actual item for sale. Item is on hand and ready to ship.